Hair metal, also commonly known as pop metal and glam metal, is a sub-genre of heavy metal music which features pop and blues-influenced guitar hooks and riffs, and borrows from the fashion of 70’s glam rock. Inspired by 70’s glam and punk rock music movement from legends such as Alice Cooper, New York Dolls and David Bowie, hair bands rose in the late 70’s and early 1980s in the U.S., particularly around L.A.’s Sunset Strip music scene. Hanoi Rocks has been cited as one of the first and most influential bands of the 80’s glam rock movement. 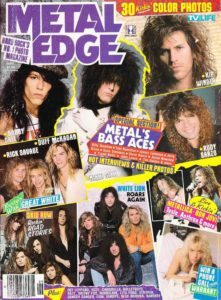 While bands like Mötley Crüe, Ratt, Quiet Riot, Van Halen and Dokken first took heavy metal mainstream, later bands like Bon Jovi, Poison, Cinderella, Warrant, and Whitesnake made hair bands songs a stable on the Billboard Hot 100 charts. The late 80s and early 90s were in deed a time of high flying guitar solos, power ballads, flashy spandex, leather jackets, excess makeup, and of course, big hair. Well, mothertruckers, if you’ve ever spent time trying to make your rock guitar sound like a motorcycle along with Mick Mars, you belong here. If you’ve ever rocked a Joe Elliott mullet with no shame, you belong here. If you sang “I Remember You” from the top of your lungs in the shower, you belong here. If you love or hate Bret Michaels for having a VH1 show, you belong here too and you’re not alone. This is the place to find out everything you need to know about your favorite hair bands. You may even discover some hidden gems who were flying the hair metal flag high back in the day. So bust out your Aqua Net again and check out their big hair story, along with the albums and music videos we all know and love. Where to Buy Motley Crue Vintage Concert T-Shirts? © copyright 2018 hairbands.xyz. all rights reserved.